We're all familiar with the charts produced by news events that cause a sudden and massive expansion in volatility, as shown below in this example from my blog archives. However the majority of the time a news event results in a much less dramatic outcome. So when a news event turns out to be a bit of a non-event, should we discard it as being insignificant and simply carry on with our prior directional bias? As seen below on the Euro, news events from last Friday and then again on Monday produced candles which would not be considered significant, when comparing their range (H-L) with prior candle ranges. While failing to lead to a sudden and dramatic change in environment, both events were still significant. 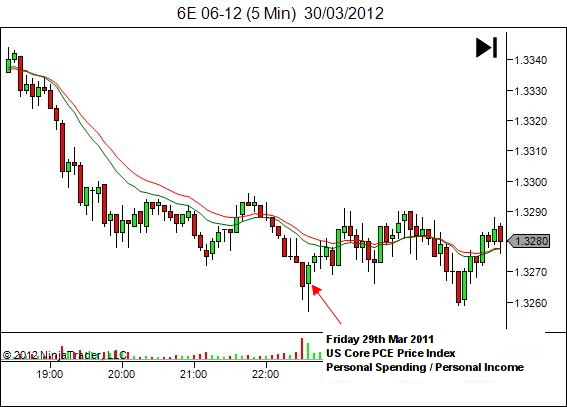 In both cases, the news release still acted to change the sentiment within the market. 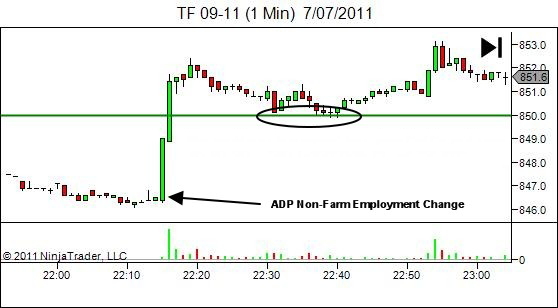 On Friday's chart you'll see that the news release acted to halt the downtrend and initiate a sideways trending market. 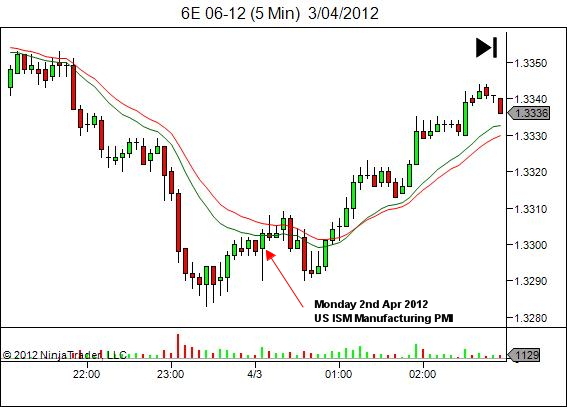 And on Monday the news release initially stalled the downtrend, eventually leading to a reversal to uptrend. How do I prepare for this potential change of environment? 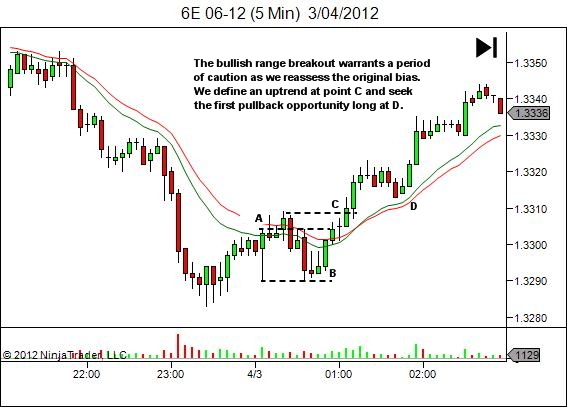 I use standard opening range breakout theory on the trading timeframe news-event candle. 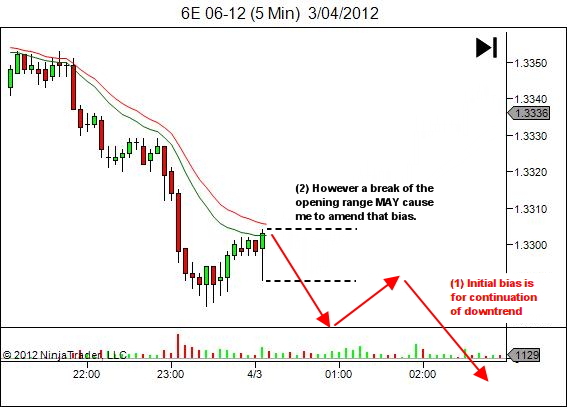 So looking at Monday for an example, my initial bias for continuation of the downtrend is shown in red (below). However I'll also bracket the high and low of the news candle. In the event that price breaks the range low I would likely carry on with my existing bias, seeking pullback entries short. But if price breaks the high of the range I find myself in a conflicting situation; a bearish pre-news bias combined with a bullish post-news range break. There are no hard and fast rules in this situation. In the event of a clear and definite break of point A I may immediately reassess the bias as bullish and seek entry opportunity long. However in this example the breakout was weak. Conflicting information requires a period of caution where we stand aside and await clarity. In hindsight, failure of the break at A provided opportunity short, and failure to break the lows at B would have been an exceptional long entry. We don't trade hindsight though, unfortunately! Unless I get exceptional setups, in the event of conflicting post-news bias l prefer to stay on the sidelines until I see some conviction in one direction or the other. In this case, I'll reassess the bias as bullish on the break at point C, with the uptrend providing a nice pullback long at D.
Yeah, it's messy having two potentially conflicting bias. But that's trading. Just stand aside until you get some clarity. Don't discount the importance of a news event if it produces only minimal impact on price. It can still act to change sentiment within the market. Watch for a range breakout to provide a more immediate assessment of that sentiment and consider whether it supports your prior bias, or warrants a period of caution until the sentiment is more clearly seen.